2015 Table Type 4 Color 1 Station Single-Rotary Screen Press can simultaneously install four screen plates and the screen Holder can rotate independently after installation, which is available for four colors' overprinting and making progressive proofs of screen printing business. Comparing with the original 4color 1 station printer, this new type machine has a function of micro-adjust/registration. If you want to do precise color matching, you can use those small red handles to move the screen frame right or left slightly. It will be a good choice for colorful printing. Screen printing is arguably most versatile in printing, almost everything can be used as substrate. 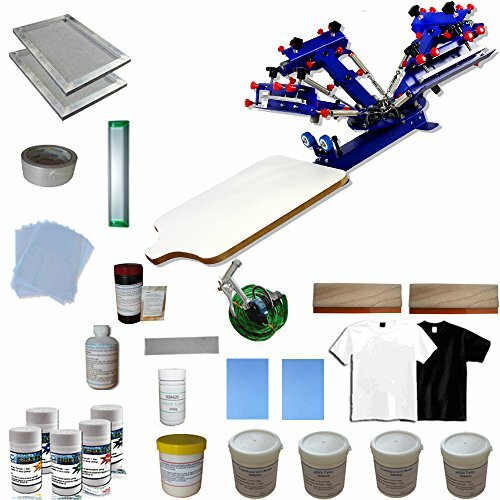 Our company provide this 4 color 1 station screen printing starter kit with high quality at a reasonable price, designed to easily set-up, register and print.This package is constitute of some necessary screen printing consumables and materials.